Service Provider of a wide range of services which include Network Management, Collaborative Solutions, Security Solutions, Disaster Recovery And Management, Facility Management Support and Documents Digitization Service. At the core of any business network resides its architecture - the foundation upon which productivity and scalability is achieved. Mostly unseen and many a times taken for granted, this network foundation always acts at a launch pad for all current and future organizational needs and help seamless integration of new technologies into your existing network. A poorly planned network architectural foundation almost always results into loss of revenue, downtime, huge revamp cost, frustration and loss of your valuable time. 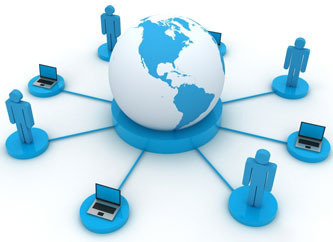 Reliable and scalable network architecture includes LAN, WAN connectivity, application server's placements, accessibility and availability, security, storage and network administrative modeling. V5 InfoTech. Truly understands these functional and mandatory requirements for your organizational needs. Our team of certified experts design architectural solutions and implement scalable networks, maximizing up-time and simplifying network administration. Business without a proper collaborative solution is like an orchestra without a conductor. This is one service that drives all businesses in modern times. Sending and receiving emails from your desktop! - No, it's not just about that. There's a lot more to it than one could possibly think. An organization needs to be equipped with new age technologies and need to adapt to these collaborative solution to have a competitive edge over others. Turning a blind eye to security; that your business has never been hit and it will not happen to you, would cost your organization dearly. Are your organizational resources protected from the prying eyes of an intruder? Threats are lurking at every point, waiting to pounce upon a smallest vulnerability in your network. Our team of experts can help assess your organizational network and provide the right security solution to take care of your Networks, Servers and Desktops, access and transactional security needs. From desktops/servers to datacenter sites; data backup, failover redundancy, disaster recovery sites are the norms. Today's business operations demands high availability of systems and continuous access to mission critical information. Organizations are challenged to protect against disruptions in service and loss of data include widespread power losses, natural disasters, malicious activity and terrorism. Organizations must deploy an infrastructure to secure both critical and general day-to-day data. Often these include interconnection of data centers across regions, separated by tens, hundreds or even thousands of miles. A sound disaster recovery business continuity plan is essential to protect the well-being of an organization. Our expertise at V5 InfoTech. Can help you plan and deploy Asset Management Services that could help you automate all of these tasks, leaving you free to focus more on other jobs. Assembled, Dell, HP, HCL, Lenovo, Acer and any Branded available at market. Dell, HP, Lenovo, Acer and any Branded available at market.